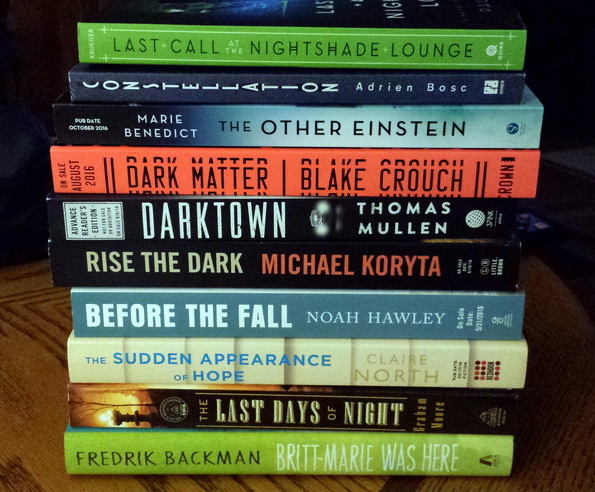 Last week I attended BEA and that means lots of new books. Over the three days I picked up a total of 40 books — not a lot by BEA standards but only as many as I could carry. I was going to bring my rolling bag on days two and three, but when I hauled it out of my closet, a wheel broke off! I think the book gods were trying to tell me something. Today I’m featuring 10 books that were already on my want-to-read list. I ended up picking up another 30 books that were too tempting to pass up. I will write about those in the coming weeks. Last Call at the Nightshade Lounge by Paul Krueger from Quirk Books. Constellation by Adrien Bosc from Other Press. This best-selling debut novel from one of France’s most exciting young writers is based on the true story of the 1949 disappearance of Air France’s Lockheed Constellation and its famous passengers. The Other Einstein by Marie Benedict from Sourcebooks. Dark Matter by Blake Crouch from Crown Books. Darktown by Thomas Mullen from Atria. The award-winning author of The Last Town on Earth delivers a riveting and elegant police procedural set in 1948 Atlanta, exploring a murder, corrupt police, and strained race relations that feels ripped from today’s headlines. Rise the Dark by Michael Koryta from Little, Brown. Rise the dark. These were the last words written in Lauren Novak’s notebook before she was murdered in a strange Florida village. Before the Fall by Noah Hawley from Grand Central Publishing. On a foggy summer night, eleven people-ten privileged, one down-on-his-luck painter-depart Martha’s Vineyard on a private jet headed for New York. Sixteen minutes later, the unthinkable happens: the plane plunges into the ocean. The Sudden Appearance of Hope by Claire North from Redhook. The Last Days of Night by Graham Moore from Random House. From Graham Moore, the Academy Award–winning screenwriter of The Imitation Game and New York Times bestselling author of The Sherlockian comes a riveting historical thriller about the “War of the Currents,” the famous race for glory and riches between Thomas Edison and George Westinghouse. Britt-Marie Was Here by Fredrik Backman from Atria. A heartwarming and hilarious story of a reluctant outsider who transforms a tiny village and a woman who finds love and second chances in the unlikeliest of places. 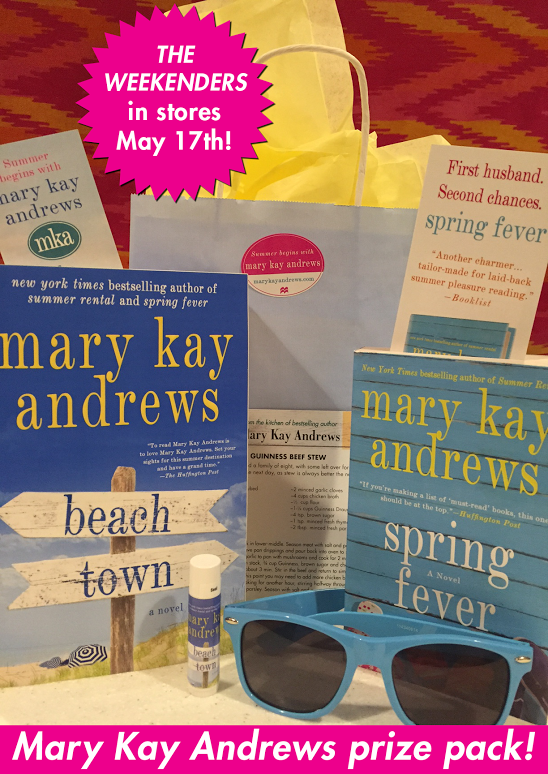 Just in time for summer, I have a giveaway of two MKA paperbacks and swag. Yes, the gods were telling you to go easy with the books 😀 These all look great! Wow, you picked up some great looking books! After reading, and loving, A Man Called Ove, I will definitely have to read Britt-Marie. The only time I ever attended BEA (2008 in LA), I was totally unprepared for carrying away books, so I filled up several tote bags, staggered out the the event center, and called a cab. After that I bought some rolling bags, prepared for future events. But everything has been too far away! With this year in Chicago, I am encouraged that it is moving slowly toward the West Coast again. I love your stack, though; I want Britt-Marie Was Here and I’ve been eyeing Before the Fall. Enjoy! Hope you had a great time at BEA! I still have never been, maybe someday! All your books look wonderful- enjoy! Wow! Sounds like you had a great BEA haul even though your roll-along broke! Enjoy all of your new books! I only attended BEA once, nice haul of books. Nice haul! I have Britt-Marie Was Here and hope to get to it soon. I loved Britt-Marie – I think you will too. I don’t know any of the other books.